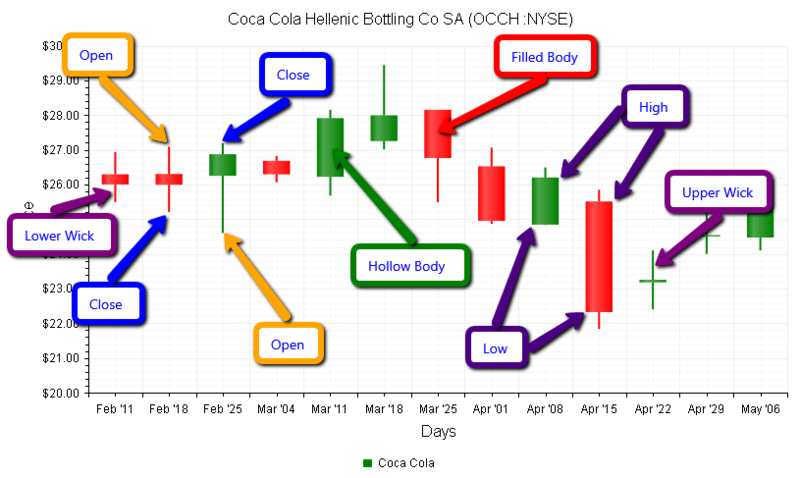 Body - the wide part of the CandlestickSeriesItem that shows the Open and Close prices. If the Close price is higher than the Open price, the body is called Hollow (usually colored white or green)and the BackgroundColor property of the CandlestickSeries -> Appearance -> FillStyle inner tag controls its color. If, however, the Close price is lower than the Open price, the body is called Filled (usually colored black or red) and the DownColor property of the CandlestickSeries tag controls its color. Wicks - the long thin lines located above and below the body, also called shadows that show the High and Low prices. The High price is represented by the top of the Upper Wick, while the bottom of the Lower Wick indicates the Low price. The color of the Hollow CandlestickSeriesItems (Open Price < Close Price) of each series is controlled via the BackgroundColor property of the CandlestickSeries -> Appearance -> FillStyle inner tag. The color the Filled CandlestickSeriesItems (Open Price > Close Price) of each series is controlled via the DownColor property of the CandlestickSeries tag. Open, High, Low and Close values of each item are controlled respectively by Open, High, Low and Close properties of the CandlestickSeries. The title, background colors and legend are controlled via the inner properties of the RadHtmlChart control and are common for all charts. More information on the matter is available in the Server-side API and in the Element structure articles. Not all properties are necessary, the RadHtmlChart will match the axes to the values if you do not declare explicit values, steps and tick properties (although the Items for axes that need them are necessary). <telerik:RadHtmlChart runat="server" ID="CandlestickChart" Width="800" Height="500"
<YAxis AxisCrossingValue="0" Color="Black" MajorTickType="Outside" MinorTickType="Outside"